We know choosing a food service company for your Chapter can be hard. Everyone coming at you with pictures of the amazing food, promises of all the fun and trendy food, how amazing it will be when you get their chefs in the kitchen. We've seen it time and time again, your Chapter had 3 options. You did the due diligence and got multiple bids and lined them all up next to each other and voted. Collectively, you all voted on the cheapest option because obviously it is money that can be put in the budget somewhere else (we know, it's how all businesses work). What you didn't consider is: how could this work out in the long run? Going with the cheapest option might seem like a great idea at first, until the novelty wears off and you realize that they were the cheapest for a reason. Your chef quickly falls downhill into serving frozen veggies, your chef is unhappy, maybe not even showing up for work, and the food just isn't living up to the promises. The reason: they were the cheapest option and their promises just aren't sustainable. When looking into hiring a quality food service company for your Fraternity or Sorority, you definitely get what you pay for. At Greek House Chefs, we believe that filling up our dining rooms with hungry college students is crucial to keeping Greek Life thriving and healthy. So, how do we make sure dining rooms are full at dinner? With fresh, delicious meals and overflowing salad bars, endless options, allergy accommodations, trained and professional staff who are fully engaged in the chapter's happiness. We hire real Chefs and teach them the GHC way. Greek House Chefs can proudly say that we will never be known as the “cheapest” option, but we will be the best. Quite frankly, when a chapter house hires the least expensive option based on price alone, that typically means an hourly line-cook with a budget that matches. When a food service company undercuts or lowers pricing to get the business, the chapter suffers the effects. 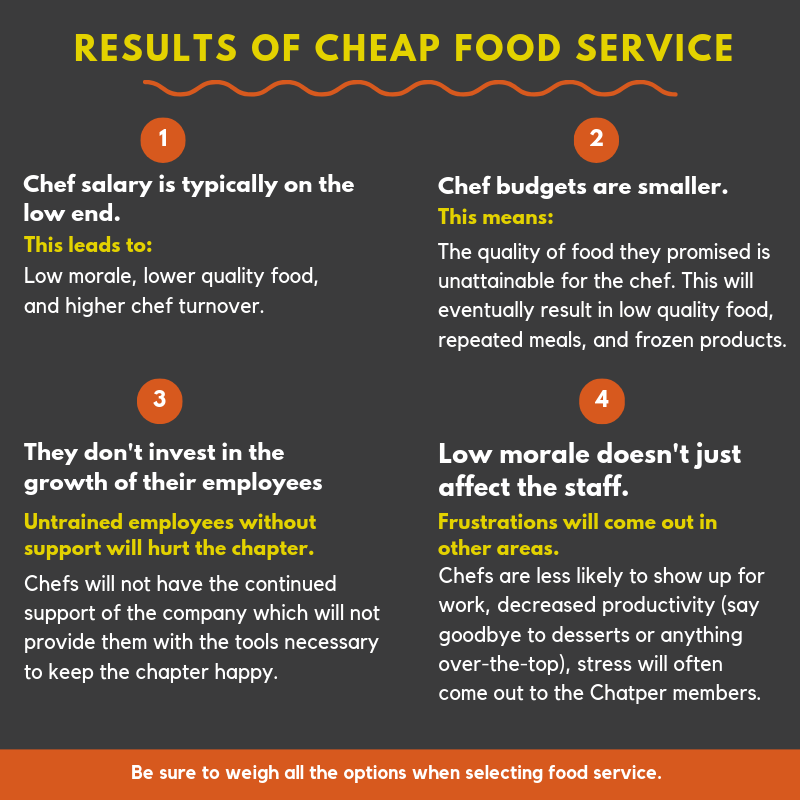 Hiring quality Chefs who are trained with hands on management won't happen with the cheapest option. From there, the line cooks' hands are tied with low budgets which leads to low morale. We’ve seen it happen over and over and many of the Chapter Houses end up calling Greek House Chefs to come in and take over, often mid-semester. At Greek House Chefs, we employ Chefs that are perfectly matched with each specific chapter house. Once they have successfully completed our extensive interview process and our OneSource background check, the training begins. Greek House Chefs employs a “Blue Coat Army” of traveling Chefs that fly all over the country to teach, coach and train our new Chefs. From there, our Chefs are given generous food budgets to source the only the best items for their chapter house. We insist that our elite Blue Coat Chefs spend their budgets on seasonal, healthy, fresh produce and stand-alone proteins. We never go the “cheap route” with carb-heavy meals such as pasta bakes and endless starches, otherwise known in the industry as "fillers”. Many of our Fraternities and Sororities opt to have 24-hour snacks and weekend pantry service. Our Chefs are given the budget to stock the kitchen with fresh yogurt parfaits, veggie cups, hummus, freshly cut fruit, deli meats and cheeses, assorted fresh multi-grain breads and all kinds of grab-and-go items. Some of our Chefs even make homemade cookie dough for the weekends and leave behind homemade soups and other items that can be easily warmed up for our busy college students. Now that is an engaged and committed chef that you won't find with a cheaper company paying their chefs lower wages. At GHC, we salary our Chefs year-round (should they choose). Our pay rate matches the industry pay grade and our Chefs enjoy a work-life balance that most Chefs only dream about. Our Chefs are provided all the tools they need to succeed at their Fraternity or Sorority which is what sets us apart in the industry. They have strong management support, multiple vendors to assist in sourcing local produce and specialty items, and they are encouraged to go above and beyond at each meal. Some of our more inexpensive competitors force their chefs to shop around to find the best deal at a handful of vendors which leads to the chef spending an exorbitant amount of time shopping around, rather than putting love into their food. When your Chapter partners with Greek House Chefs, we are in it for the long haul. We never want to “go cheap” just to earn your business, because we know that ends up with unhappy chapter members. When a fraternity or sorority has unhappy chapter members on the meal plan, it ends up becoming costly for the Chapter at a much higher level. A testament to quality over price, we still have our original houses at Iowa State University, twelve years after our start. From Iowa State, we have branched out nationwide with a year after year retention rate of 99%. There's a reason that GHC did not lose a single chapter house last year to any of our competitors and that makes us so proud. Greek House Chefs is dedicated to customizing a meal plan that will fit perfectly in your Chapter house. We don’t sell packages or cheaper tiers. We provide happy Chapter members delicious food service that ensures full dining rooms and happy students. After all, our motto is to “bring ‘em home” and that is what we are committed to. If you're looking for the GHC difference in your Chapter make sure to get a quote today. In "Insider" , "Blue Coat Chefs" , "Greek House Chefs" , "Greek Life" , "Sorority Food Service" , "GHC"
In "Blue Coat Chefs" , "Fraternity Food Service" , "Greek House Chefs" , "Greek Life" , "Our Brand" , "Sorority Food Service" , "GHC" , "Food"
In "Insider" , "Fraternity Food Service" , "Greek House Chefs" , "Greek Life" , "Our Brand" , "Sorority Food Service" , "GHC"